I was in the Cauvery Wildlife Sanctuary, named after the beautiful river that flows through it. In October, the trees in the forest were already beginning to shed their leaves, and the landscape looked brown and drab. Except, that is, the part of the sanctuary through which the river flows. The silver ribbon of water was flanked on both sides by riverine trees that remain evergreeen through the year, unlike their deciduous cousins on the hill slopes. It was in this green strip along the Cauvery that I had spent the past couple of days, admiring the river, marvelling at the forest and looking for its wildlife. The water was clear and cool as it danced among the rapids, then dark and still as it settled in deeper pools underneath the riverbank trees. Fish occasionally splashed out of the surface, watched closely by the fish-eagles soaring above. Half-hidden crocodiles swam lazily from one bank to the other. In the early mornings and late evenings, the crocodiles gained fresh energy, slapping their tails against the water as they showed off to each other. Very early one morning, at sunrise, a crocodile emerged directly in front of me, in the middle of the river. It raised half of its body out of the water, puffed up its massive pale throat and growled loudly, twice, before sinking back. I caught my fingers trembling, although I was a safe 30 metres away, on the bank. The trees along the river were mostly towering Arjunas, broad trunks rising pale and smooth, higher and higher, until the first branches appeared. On a morning walk I saw sets of dark red vertical cuts, gouged deep into the trunk of an Arjuna tree. I was told that sloth bears regularly climb the trees; not for their hard and inedible fruits, but rather to raid beehives for their precious honey. I can still scarcely believe that big shaggy bears climb 15 metres of entirely smooth, entirely vertical tree trunks, as routinely as they snuffle for termites on the ground. At midday one day, I was idling in the shade of a tamarind, watching a pair of grizzled giant squirrels chasing each other among the branches of a neighbouring Arjuna tree. For all I knew, they might have been rivals in a territorial battle, or perhaps just playing in sheer joy. Then, before I was fully aware of it, one of the squirrels lost its grip and fell ten metres to the ground. The thud was sickening. Frozen to the spot, I watched anxiously, certain that the animal must either be severely crippled or dead. After a few seconds, it rose hesitantly to its feet, and looked slowly to the left and the right, its comrade watching from a branch as high as a three-storey house. For a moment it looked like it would collapse. Then it hobbled painfully and slowly around the trunk of the tree from which it fell, past a neighbouring Arjuna, and stopped at the base of the next tree, a tamarind. It looked up the trunk, as though considering its options, as I held my breath. Then, claws gripping the corrugated bark, it bounded up the tree – and in a flash it had disappeared into the canopy. As my breath came back, time began to flow once more, and sound returned — of the river, the jumping fish, the breeze in the leaves, and the worried calls of the other squirrel above me. The Cauvery brings precious water to farms and cities; but is also home to otters, crocodiles, the enormous mahseer fish, and a host of other wild animals. 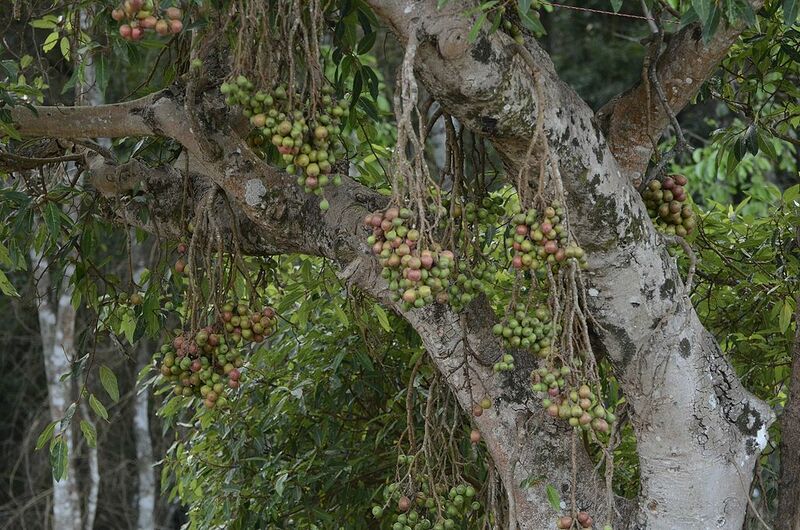 Arjuna trees (Terminalia arjuna) are a typical riparian species, which means that above all they love to grow by the side of streams and rivers. 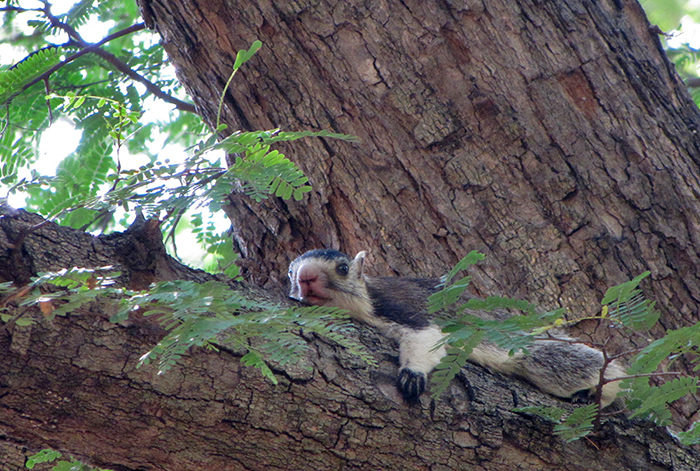 The grizzled giant squirrel is a massive squirrel, measuring upto almost a metre from tip of nose to tip of tail. It is called ‘grizzled’ because of the white that intermingles with the brown hair on its head and back. This squirrel is restricted to a few parts of Sri Lanka and southern India, but its larger cousin, the Indian giant squirrel, is much more widespread across peninsular India. This article appeared in the Hindu in School on 16 November 2016. What is it about fig trees? Miscellaneous	What is it about fig trees?